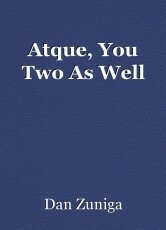 "Atque"-Latin, 'and.' A conjunction between two phrases or ideas. The camera shuttered into place, the flash of light drew back, and as he was still recovering, the evening wind pushed against the doorframe and whistled in the hallway outside. Twisting about in his head until he had made a full revolution to face her again, she was still smiling all the same. They were shooting in a makeshift studio, close to the street and the commute itself, removing the emptiness of the air outside. Although not quite there, the perseverance of the French curtains, rippling in time with the wind and the traffic, brought energy to the poised stillness. Binders, complete with demo takes and reference cards, were stacked neatly in the corner opposite the door. In the center of the room was the backdrop: itself an amateur, yet impassioned easel for which the artist took her best. Standing lights, although dim, gave the impression of softness, much like fireflies on a summer hill. At its apex stood the subject, a tall, handsome man of about thirty-five, dressed unlike the season. In his apparel of fleece and leather, he was uncomfortably out of place in everywhere but here. The photographer lowered the camera down to look thoughtfully at the composition. She was younger than the man, maybe mid-twenties, and had the sophistication to command confidence, while retaining the innocence of her youth. Perhaps not immediately out of college, but with enough closeness to have avoided the monotony of a career, she was energetic, and kept to readjusting and posing of the set until it fit her frame of mind. It was with these qualities she had been able to begin her upstart as both a studio and freelance photographer. It was a look she was trying to break into, a trend that was becoming more popular with the advent of technology. The role of the photographer in the society as it was became both satisfying and inherent. People demanded less wordplay in a time where there was none, and the lendings of misspeak and definition became skewed. Contributing to a growing need for visual pleasure, the world craved imagery. And so fit the lifestyle she had chosen. Of course, anyone who would go out and rent a studio and the equipment was sure to have their share of challenges, but that was the beauty of her : she had her whole life to overcome it. Staying silent but grinning all the same, she clicked away, changing position herself by shifting from heel to toe, even flexing out occasionally to fulfill some uncommitted angle. The man stood center, smoothly transitioning between every few shutters to define a new look, although careful to avoid the stigma of the flash. He had been in the industry a fair while, yet neither long enough to have developed a performance ego, or to have forgotten the value of the independent. He himself had started young, perhaps even as a child, scouted out among a hundred faces to be the glazed face of some seasonal trend or outdoor playground set. In between the years of his breakout and this moment he may have had a fair number of relationships. In his mind, only one can be recalled as being special. It must’ve been a woman he met during his experimental days away from home, where he took a year off to pursue his idea of success. She might’ve been an artist herself, or otherwise a nomad, never content to the settling of oneself. Nevertheless, they had had an apartment in the city, living together for many seasons before his work inevitably pulled him away for nights’ at a time. Her own feelings of quiet despair overtook her, grappling with that same sense of loss she had felt as a child. This was likely the reason she was never long to any place or person. It was for that same reason that he returned one day to find she had left. And so he stood, transitioning between the shutter of every shot. He had agreed to this gig in the hopes that he could forget his years away, and in the same manner return to a simpler time that, in his own mind, could bring back a fading wholesomeness. He had been good at what he did, although never accustomed to the flash of the camera. Perhaps there existed an undiagnosed sensitivity to light, an adverse quality to his own line of work. Maybe he knew that himself, but was too embarrassed or yet too proud to ever admit it. That is likely why he had told the young woman that he had never modeled before, to write off the feeling of inadequacy as an amateur quality. The photographer was beckoning him over to come and review the shots. In the back of his mind, he was fulfilled for the time being, an effective yet temporary subsidy for his own purpose and presence. He had only just met her, a mutual having arranged them to meet for a session. Thus, he owed her nothing but his being. He felt he could not match the excitement or enthusiasm of the photographer, but continued with his professional grace, mustering a mock grin as he strode over to the young woman. Filtering between each take, they nodded or shook their heads, one entirely agreeable to the other. When it was done, he thanked her for the opportunity, they shook hands and exchanged contacts, and he left through the same door the wind had pushed shut. She stayed to clean, turning off the lights, rearranging the same stack of binders, closing the windows, drawing about the curtains, stashing the camera away in her bag, and leaving herself, locking the door behind her as she did so. He had taken public transport to get there, and he did the same to get back. It was night by now, surely. The lights of the car peered in through the grimy windows of the bus. Averting eyes and the passing vehicles, the man closed his eyes. He was a model, but he wasn’t particularly good in public. Through his closed lids, he saw the flashes. He figured some part of him was still stuck in the studio, somewhere in the middle.